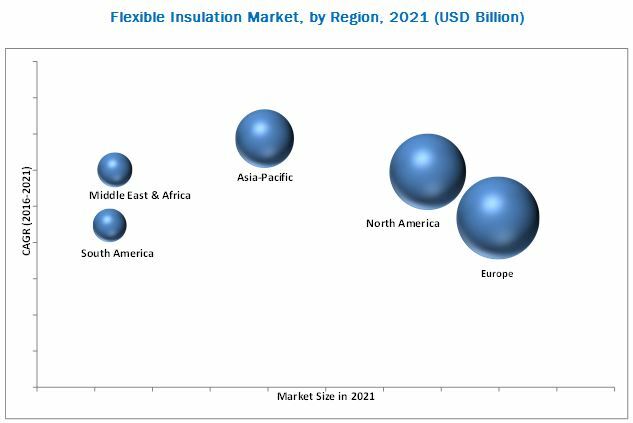 [156 Pages Report] The Flexible Insulation Market size was USD 7.77 Billion in 2015 and is projected to reach USD 10.84 Billion by 2021, at a CAGR of 5.54% from 2016 to 2021. In this study, 2015 has been considered the base year, and 2016–2021 the forecast period to estimate the market size of flexible insulation. 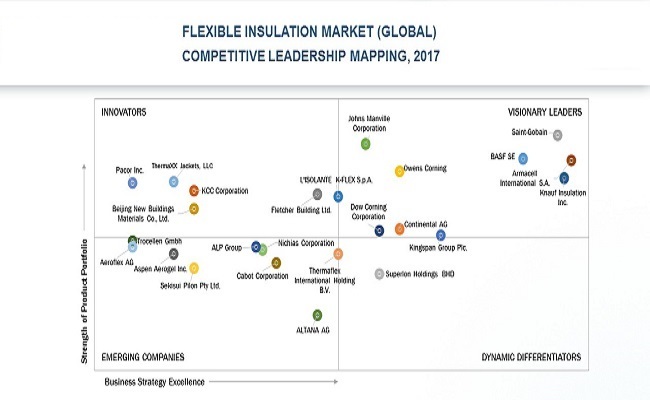 Companies producing flexible insulation include Saint-Gobain (France), Armacell International S.A. (Luxembourg), BASF SE (Germany), Johns Manville Corporation (U.S.), Owens Corning (U.S.), Knauf Insulation Inc. (U.S.) , Continental AG (Germany), Kingspan Group Plc. (Republic of Ireland), Dow Corning Corporation (U.S.), Superlon Holdings BHD (Malaysia), L'ISOLANTE K-FLEX S.p.A. (Italy), Fletcher Building Ltd. (New Zealand), KCC Corporation (South Korea), Thermaxx Jackets, LLC (U.S.), Beijing New Buildings Materials Co. Ltd. (China), Pacor Inc. (U.S.), Thermaflex International Holding B.V. (Netherlands), Nichias Corporation (Japan), ALP Group (India), ALTANA AG (Germany), Cabot Corporation (U.S.), Aspen Aerogel Inc. (U.S.), Trocellen GmbH (Germany), Aeroflex AG (Switzerland), and Sekisui Pilon Pty Ltd. (Australia). “Thisstudy answers several questions for the stakeholders, primarily, which market segments they need to focus upon during the next two to five years to prioritize their efforts and investments”. This report categorizes the global flexible insulation market based on material, insulation type, and region. 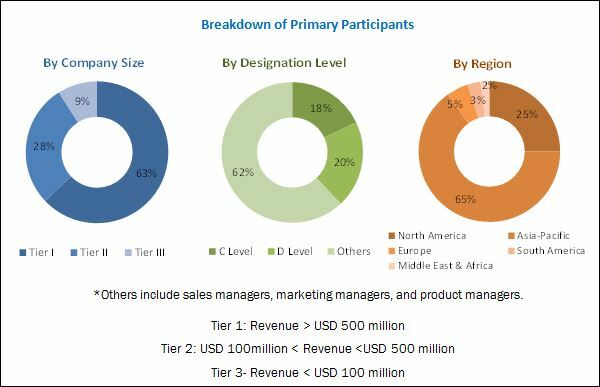 The flexible insulation market is projected to reach USD 10.84 Billion by 2021, at a CAGR of 5.54% from 2016 to 2021.The global flexible insulation market is expected to be driven by the growing demand from end-use industries such as building & construction, heating, ventilation and air-conditioning (HVAC) and the transportation sector. Flexible insulations are those insulations which can be applied successfully or flexibly in those applications wherein other materials cannot be used. Flexible insulations are used to save energy, maintain process temperatures, provide fire & sound protection, and prevent condensation. Fiberglass insulation accounts for the largest share in the material segment. The market for fiberglass insulation is estimated to witness significant growth owing to the increasing usage in various applications due to its lightweight, non-combustible, high tear strength and corrosion-resistant nature. Also, fiberglass finds usage in various applications such as thermal insulation for pipe work in HVAC industries, flexible air ducts, residential and commercial refrigerators & freezers, jet-engine ducting, aircraft component, and commercial construction. Thermal insulation is estimated to witness the largest share in the insulation type market. This is because thermal insulation provides a comfortable and hygienic indoor climate at low ambient temperatures. Also, growing use of thermal insulation for low temperature, intermediate temperature, and high temperature insulations is expected to drive its demand. The European region is the largest market for flexible insulation, in terms of both, value and volume. The strict building energy codes, accompanied by European Union Directives to improve efficiency in buildings is expected to drive the demand for flexible insulation in the region. Strong demand for flexible insulation from the housing sector in countries like Germany is another reason for the growth of the flexible insulation market. Below mentioned MicroQuadrant identifies the leadership position and strengths of various players in the industry. Lack of awareness about insulation in some of the countries of Africa, and Asia such as Libya, Western Sahara, Uzbekistan, Tajikistan, North Korea, and Nicaragua act as a restraint for the flexible insulation market. The competitiveness of the flexible insulation market is increasing with expansions and new product launches. Strategic developments are mostly undertaken by major players such as Saint-Gobain (France), Armacell International S.A. (Luxembourg), BASF SE (Germany), Johns Manville Corporation (U.S.), Owens Corning (U.S.), Knauf Insulation Inc. (U.S.), Continental AG (Germany), Kingspan Group Plc. (Republic of Ireland), Dow Corning Corporation (U.S.), and Superlon Holdings BHD (Malaysia), L'ISOLANTE K-FLEX S.p.A. (Italy), Fletcher Building Ltd. (New Zealand), KCC Corporation (South Korea), Thermaxx Jackets, LLC (U.S.), Beijing New Buildings Materials Co. Ltd. (China), Pacor Inc. (U.S.), Thermaflex International Holding B.V. (Netherlands), Nichias Corporation (Japan), ALP Group (India), ALTANA AG (Germany), Cabot Corporation (U.S.), Aspen Aerogel Inc. (U.S.), Trocellen GmbH (Germany), Aeroflex AG (Switzerland), and Sekisui Pilon Pty Ltd. (Australia), among others. 10.12.4 Beijing New Building Materials (Group) Co., Ltd.
10.12.10 Sekisui Pilon Pty Ltd.
10.12.12 Thermaflex International Holding B.V. Figure 14 Increase in Green Buildings in U.S.